Big Island police are searching for a man wanted in connection with an attempted murder in Puna on Thursday night (August 11). Puna Patrol officers responded to a Waʻa Waʻa address at 11:35 p.m. Thursday after receiving a report of a verbal dispute and possible gunshots. Officers were unable to locate anyone at that address but determined that an injured 26-year-old man, who has no permanent address, had been taken to the Pāhoa fire station by private vehicle. The victim, who sustained a gunshot wound to the lower body and a grazing wound to the head, was treated for his injuries Hilo Medical Center and released. Police are seeking 34-year-old Maurice Hackett, who has no permanent address but frequents the Waʻa Waʻa area. 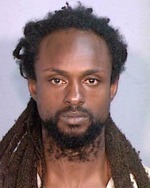 He is described as African-American, 6-feet tall, 180 pounds with brown eyes, a beard and black hair worn in dreadlocks. He may be operating a white rented van with no side windows. Police caution the public not to approach Hackett, as he is considered armed and dangerous. Anyone with information on his whereabouts is asked to call the Police Department’s non-emergency line at 935-3311.Tipsters who prefer to remain anonymous may call Crime Stoppers at 961-8300 in Hilo or 329-8181 in Kona and may be eligible for a reward of up to $1,000. Crime Stoppers is a volunteer program run by ordinary citizens who want to keep their community safe. Crime Stoppers doesn’t record calls or subscribe to caller ID. All Crime Stoppers information is kept confidential.